Operating revenues in private radio broadcasting fell 1.9% (-$30.0 million) from 2016 to $1.5 billion in 2017. This was the fourth consecutive annual decrease. A 3.1% decrease in the sale of local advertising led to the drop in operating revenues. In 2017, 98.4% of total operating revenues in private radio broadcasting were generated from advertising sales. Profits before interest and taxes totalled $284.8 million, representing a profit margin of 18.7% in 2017. The profit margin has remained fairly stable over the past four years. Operating expenses fell 2.0% to $1.2 billion in 2017. 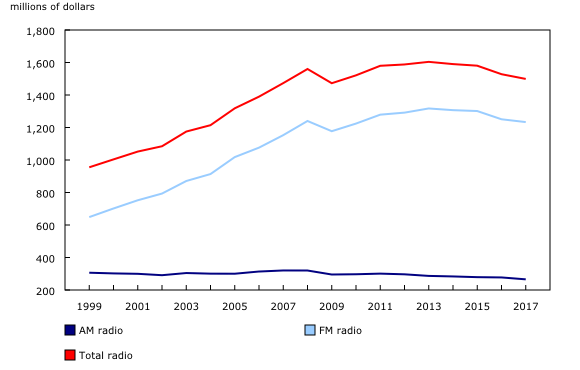 Private radio broadcasters in Ontario were the most profitable in Canada in 2017. Ontario's operating revenues remained stable at $552.9 million or 36.3% of total operating revenues in Canada. Operating expenses decreased 1.6% to $424.4 million in Ontario, for a profit margin before interest and taxes of 23.2%. Operating revenues in Quebec fell 1.1% from 2016 to $307.7 million in 2017. Operating expenses edged up 0.5% to $243.4 million. Private radio broadcasters in the five largest census metropolitan areas accounted for 45.7% of all advertising revenues in Canada in 2017. The operating revenues of English-language radio stations fell 2.2% in 2017 to $1.2 billion. The operating revenues of French-language radio stations declined 1.2% to $262.7 million. The operating revenues of ethnic radio stations rose 1.0% in 2017 to $49.5 million. The operating expenses for ethnic radio stations fell 0.9% to $41.4 million. The five largest census metropolitan areas in Canada are Toronto, Montréal, Vancouver, Calgary and Ottawa–Gatineau. To enquire about the concepts, methods or data quality of this release, contact Dany Gravel (613-864-1350; dany.gravel@canada.gc.ca), Investment, Science and Technology Division.